We found this recipe on CulinaryHill.com. A couple of us at our clinic have made this and modified it a bit. One of our team members is vegan, so she omitted the bacon and added a bit of coconut oil instead. 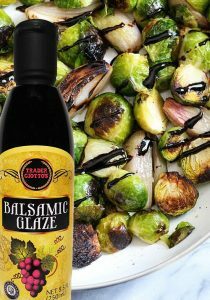 She also drizzled balsamic glaze when it came out of the oven (you can get it at Trader Joes). Another team member added a mixture of honey and balsamic, in addition to the bacon fat to the raw veg before roasting, which gave the veggies a nice caramelization. Preheat oven to 400 degrees. Line a baking sheet with foil for easy clean up. Meanwhile, cook bacon in large skillet over medium-high heat until crispy. Remove bacon from skillet, chop, and set aside. Reserve 1/4 cup rendered bacon fat and discard the rest. 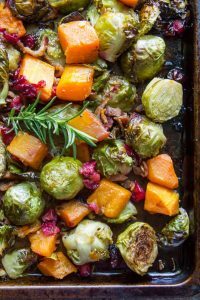 In a large bowl, toss Brussels sprouts, squash, cranberries, and rosemary with the reserved bacon fat. Spread evenly in a single layer over baking sheet, arranging the sprouts cut-side down as much as possible. Bake until vegetables begin to brown and are tender, about 40 to 45 minutes. Remove from oven and transfer to serving dish. Add chopped bacon and walnuts, tossing to combine. Season to taste with salt and pepper. Serve warm.